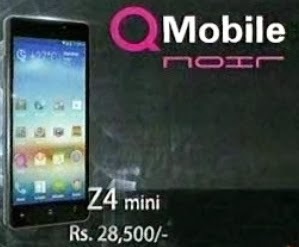 qMobile Noir Quatro Z4 Mini is a small smartphone our you can call it child of Noir Quatro Z4. Z4 Mini "The Mightier has gone compact" is come from the family of the Quatro Z4 smartphone it has 4.5'' display with 720 pixels screen resolution and 1.5 GHz Quad-core processor. Z4 Mini is a high speed and budget smartphone introduced by Qmobile company.